9 - Willie Nelson's "Trigger"
What can you say except that when a guitar looks like that, it's been around. Willie Nelson is a respected but not flashy guitarist, but more than that, he is loyal to his Martin N-20. Trigger has been with him since the beginning, and on it are the signatures that show it's journey. Nelson has been quoted as saying that when the hole in the guitar is too big for him to play it, he's done playing. Page's style on stage is the stuff of legend, but the legend always includes the double neck guitar he used to bust out and rock on. Interestingly enough, the guitar that Page is most famous for playing was pretty much just a stage guitar. Although he generally used this or a Les Paul, he was known to pick up a Fender (on which he recorded the solo for "Stairway to Heaven" or even a Danelectro. Here it is, the guitar that started it all. Without this guitar, Rock & Roll might never have become what it is today. This is the guitar that Chuck Berry still plays today, and it's responsible for the distinct sound of "Roll Over Beethoven" and "Johnny B. Goode." 6 - Stevie Ray Vaughan - "Lenny"
As far as guitars with a story go, "Lenny" is at the top of the list. You can check out the story at the Fender Custom Shop website for the guitar. Interestingly enough, this guitar wasn't even SRV's main axe. The guitar that he played most often is "Number One" and is currently in possession of his brother Jimmie, retired forever. "Lenny" however was the only guitar made available to the public at his death, at an auction where it sold to Guitar Center for almost $700,000. 5 - B.B. King's "Lucille"
"Lucille" isn't a guitar customized by the artist like "Lenny" or the "Red Special." King had no reason to deface it to make it his own. "Lucille" became famous because it was the only guitar that B.B. liked to play, and that guitar became synonymous with the blues. Though if you take note, "Lucille" is another Gibson ES-335 like Chuck Berry's, no one ever played it like B.B. does. 4 - Eddie Van Halen's "Frankenstrat"
The "Frankenstrat" is EVH's attempt to combine the best of Fender and Gibson into one guitar. Though it looks like a Stratocaster, the body and neck were actually purchased from a dealer that sold guitar parts, and were cheaper as they were not up to the quality of regular guitars. EVH made the best and hollowed out enough space to put in the Gibson style humbucker, which was supposed to be paired with a Strat style single coil pickup near the neck (it was never attached). Try forgetting this one. This guitar is not famous because it produced superior quality tones, or because the guitarist made everyone want to play it. It's famous because it was the guitar that the Beatles played on the Ed McMahon show, and for most of the beginning of their career. Don't get me wrong, there's nothing wrong with the way it sounds on songs like "All My Lovin'", but Lennon was hardly a guitar virtuoso, and yet we all remember that the Beatles played these guitars. Whether you remember this because of Woodstock, or Monterey Pop, or the reversed headstock, or just because Hendrix was amazing, everyone would love to get their hands on this guitar and play it, and plenty of replicas were made. Most of all, if you ever play this guitar in public, you likely won't sound like Jimi Hendrix, but people will know the guitar. 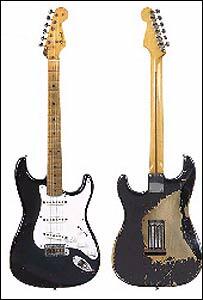 1 - Eric Clapton's "Blackie"
By the time it sold at auction a few years ago, "Blackie" was pretty beat up. That being said, Clapton did a lot with it. The sounds that this guitar made when Clapton played it were nothing short of remarkable. After fiddling with the electronics, the neck, the strings, the wiring, Clapton eventually found a winning combination to the point that Fender has created replicas with an eye for detail right down to the cigarette burns on the original. Of course, they should try and make some money off of it, they bought it at Christies for an impressive $950,000 in an auction.